NETWORK FINALS: Both CELEBRITY FAMILY FEUD and MATCH GAME gained 0.1 in final numbers, as did 60 MINUTES and BIG BROTHER, but the MADAM SECRETARY and FAMILY GUY reruns lost the same. CABLE HIGHLIGHTS: Starz solidified its hold on Sunday night drama, even though POWER fell a significant 0.28 from last week’s season premiere to 0.82, as SURVIVOR’S REMORSE joined with a 1-hour season premiere at 0.41. Those aren’t GAME OF THRONES/SILICON VALLEY numbers, but against the weaker end of HBO and Showtime’s series, they’re good enough. On HBO, THE NIGHT OF slipped 0.04 to 0.48, BALLERS fell 0.17 to 0.62, VICE PRINCIPALS dropped 0.18 to 0.37, and LAST WEEK TONIGHT returned at 0.42. At Showtime, RAY DONOVAN rose 0.08 to 0.35, and ROADIES remained at 0.08. On basic cable, Adult Swim’s SQUIDBILLIES rose 0.03 to 0.64, and BRAD NEELY’S HARG NALLIN was up 0.06 to 0.56. On AMC, PREACHER was down 0.02 to 0.61, and GEEKING OUT was at 0.18 (down 0.03 from last week’s RIDE). 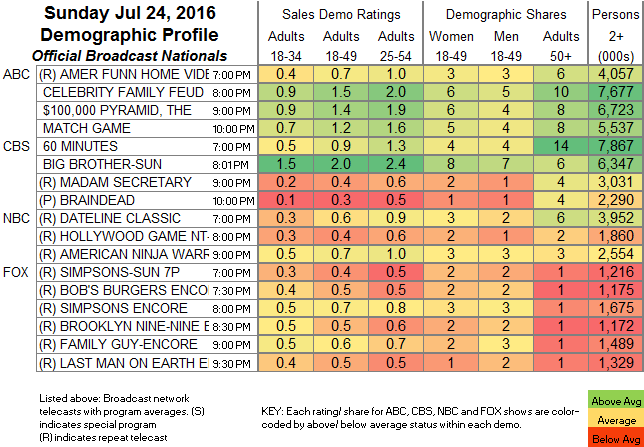 On TNT, THE LAST SHIP gained 0.03 to 0.55, and MURDER IN THE FIRST climbed 0.07 to 0.27. USA’s MOTIVE fell 0.05 to 0.15. TV Land’s THE JIM GAFFIGAN SHOW held at 0.11. CMT’s STILL THE KING fell off the chart, down 0.04 to 0.07/231K. NBC Sports Net’s NASCAR race was the highest rated cable show of the day at 1.23. Discovery’s NAKED & AFRAID rose 0.09 to 0.80. On Bravo, REAL HOUSEWIVES OF NEW JERSEY fell 0.05 to 0.62, and SHAHS OF SUNSET was down 0.14 to 0.41. VH1 aired 2 episodes of BASKETBALL WIVES at 0.55/0.49, compared to last week’s 0.52, and SHAUNIE’S HOME COURT was down 0.03 to 0.28. On Food Network, FOOD NETWORK STAR dropped 0.08 to 0.49, with a lead-in special at 0.48, and COOKS VS CONS down 0.04 to 0.36. Spike’s BAR RESCUE rose 0.05 to 0.46. 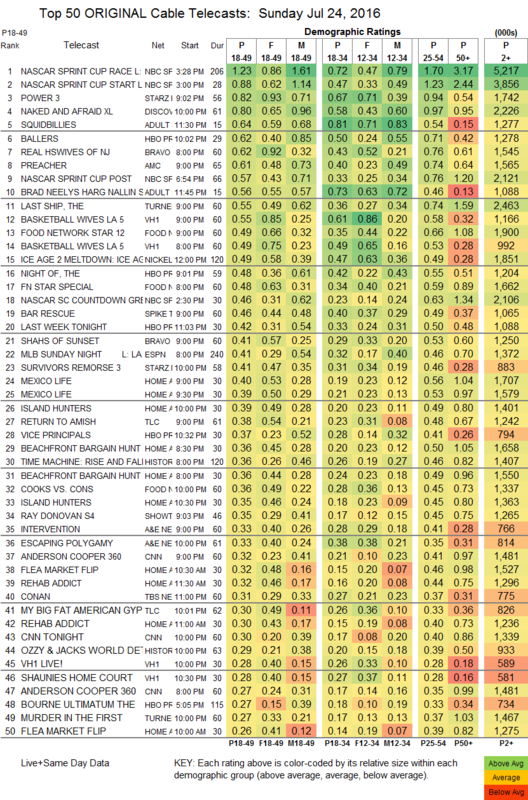 On TLC, RETURN TO AMISH ticked up to 0.38, and MY BIG FAT AMERICAN GYPSY WEDDING was up 0.06 to 0.30. On A&E, both INTERVENTION and ESCAPING POLYGAMY were at 0.33, compared to last week’s 0.33/0.37. History’s OZZY & JACK’S WORLD DETOUR was at 0.29.